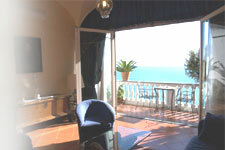 Villa Gabrisa Positano - Weddings in Positano - Top quality 4 star hotel and restaurant open for weddings in Positano. If you’re planning to have your wedding on the sublime Amalfi Coast, or indeed anywhere in the region of Campania, the 4 star Villa Gabrisa Positano could be the ideal venue for your reception as well as accommodation for the duration of your stay. Our top quality 4 star Amalfi Coast accommodation was voted the 3rd best hotel in Positano - a town famous for its extremely high quality hotels - by independent travellers on the world’s No.1 travel review site, Tripadvisor. With our adjoining restaurant overlooking the beautiful Mediterranean Sea and in particular, the Li Galli Islands off the Amalfi Coast, you could certainly find worse places for your special celebration. Our in house restaurant specialises in traditional, local cuisine, which is in itself considered among the best in Italy (now that’s saying something). We use local produce form both the land and sea and in this, less developed region of Italy, you’ll find the local produce of an unrivalled quality in comparison to the results of intensive farming found elsewhere. We offer group discounts on accommodation and in fact, if you bring the entire wedding party to our luxury Amalfi Coast 4 star hotel there might just be the possibility of some special deals for the happy couple. In addition to our on-site services and facilities, we can also arrange boat tours, excursions to other popular places in the region and tours too. Hotel Villa Gabrisa Positano, Via Pasitea, 219/227, 80067, Positano, Italy.